As a nation, the United States is often portrayed as restless and rootless. 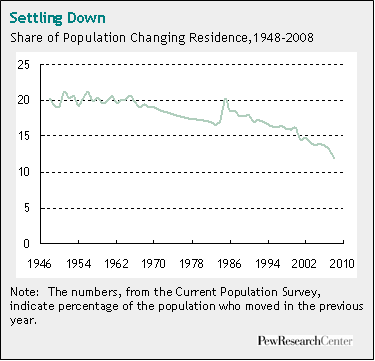 Census data, though, indicate that Americans are settling down. Only 11.9% of Americans changed residences between 2007 and 2008, the smallest share since the government began tracking this trend in the late 1940s. A new Pew Social & Demographic Trends survey finds that most Americans have moved to a new community at least once in their lives, although a notable number — nearly four-in-ten — have never left the place in which they were born1. Asked why they live where they do, movers most often cite the pull of economic opportunity. Stayers most often cite the tug of family and connections. Both the survey and Census data indicate that the biggest differences in the characteristics of movers and stayers revolve around geography and education. In the Midwest, nearly half of adult residents say they have spent their entire lives in their hometown. That compares with fewer than a third of those who live in Western states. Cities, suburbs and small towns have more movers than stayers, while rural areas are more evenly split. Three-quarters of college graduates have moved at least once, compared with just over half of Americans with no more than a high school diploma. College graduates also move longer distances — and move more often — than Americans with a high school diploma or less, and employment plays a greater role in their decisions about where to live. By income group, the most affluent Americans are the most likely to have moved. The Census Bureau’s Current Population Survey indicates that the number of people who moved between 2007 and 2008, 34 million, was the lowest since 1959-60, when the population of the U.S. was 41% smaller than it is now. The annual migration rate, which held at about 20% through the mid-1960s, has drifted downward since then to its current low of 11.9%. Analysts say the long-term decline in migration has occurred because the U.S. population is getting older and most moves are made when people are young. Another brake on moving is the rise of two-career couples, because it is more difficult to coordinate a relocation when two jobs are involved. On top of these long term trends, the current economic downturn has led to a further decline in migration, because jobs are typically one of the key magnets that induce people to move. The Pew Social & Demographic Trends survey of 2,260 adults, which was conducted Oct. 3-19, 2008, asked respondents why they have stayed in their hometowns or have moved to their current community. This report combines the survey findings with Census Bureau data on migration patterns between states and regions. Home means different things to different people. Among U.S.-born adults who have lived in more than one community, nearly four-in-ten (38%) say the place they consider home isn’t where they’re living now. But there’s a wide range of definitions of “home” among Americans who have lived in at least one place besides their original hometown: 26% say it’s where they were born or raised; 22% say it’s where they live now; 18% say it’s where they have lived the longest; 15% say it’s where their family comes from; and 4% say it’s where they went to high school. Among all respondents to the Pew Research Center survey, 57% say they have not lived in the U.S. outside their current state: 37% have never left their hometown and 20% have left their hometown (or native country) but not lived outside their current state. Movers are more likely than stayers to say that it is likely they will move in the next five years. But despite those and other differences, equal shares of movers and stayers — about six-in-ten — rate their communities overall as good to excellent. Results for this survey are based on telephone interviews conducted with a nationally representative sample of 2,260 adults living in the continental United States. A combination of landline and cellular random digit dial (RDD) samples was used to represent all adults in the continental United States who have access to either a landline or cellular telephone. A total of 1,502 interviews were completed with respondents contacted by landline telephone and 758 from those contacted on their cellular phone. The data are weighted to produce a final sample that is representative of the general population of adults in the continental United States. Margin of sampling error is plus or minus 2.3 percentage points for results based on the total sample at the 95% confidence level. Note on terminology: Whites include only non- Hispanic whites. Blacks include only non-Hispanic blacks. Hispanics are of any race. Survey interviews conducted under the direction of Princeton Survey Research Associates International. Interviews conducted in English or Spanish.